Photo created by and courtesy of Building Panoramic Photos. Those of us who love all things historical will certainly enjoy visiting Conisbrough Castle in South Yorkshire. Steeped in history taking a look around this fabulous castle is both educational and a pleasure. Hamelin Plantagenet is widely regarded to be the designer and builder of Conisbrough Castle in South Yorkshire. He was married in 1163 to Isabel widow of King Stephen's son William De Blois following Williams death. 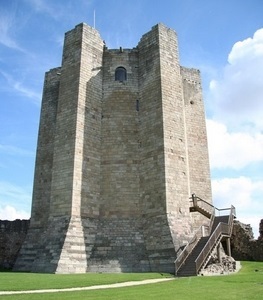 Conisbrough Castle is a formidable building dating back to the tenth century. It has been built and rebuilt over the centuries making it one of the most interesting historical sites in England. Conisbrough is a twelfth century castle located in Conisbrough in South Yorkshire. Its circular keep that measures some ninety seven feet high is supported by six huge buttresses that dominate the skyline of the area. He was born in 1385 and died in 1415 at the tender age of thirty. Richard was executed following a rebellion, known as the Southampton Plot, where King Henry V and his sons were to be murdered by the conspirators.